Nom, nom, nom – did I mention – NOM! sorry, musical interlude aside, it’s safe to say, I’m a big fan and come December 27th I decided I was going to get one! We went to Kildare Village, it’s a designer outlet with lots of stores selling their wares for heavily discounted prices (It’s. Awesome!) and from there Barty was bought! Isn’t he pretty!?! 🙂 This weekend, Barty got his inaugural cook. 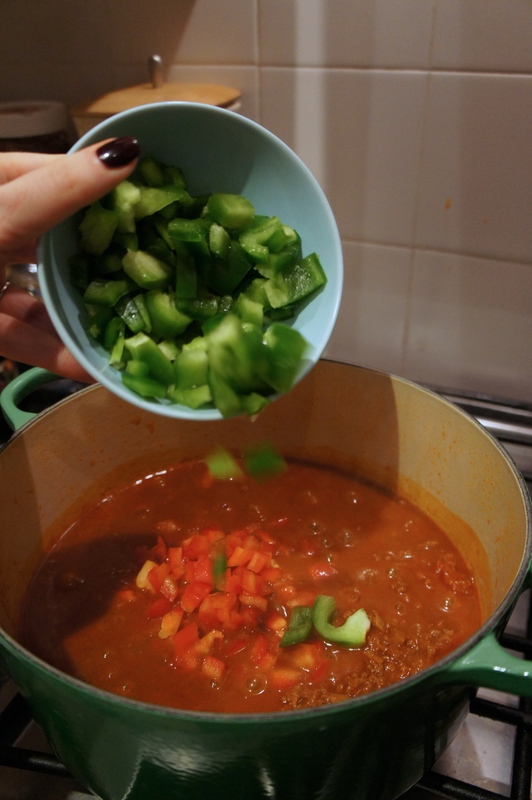 Le Creuset have a great recipe online for Chilli, however their’s is a soup, so the below is their recipe, but with a few tweaks from myself to make it, well, not a soup! 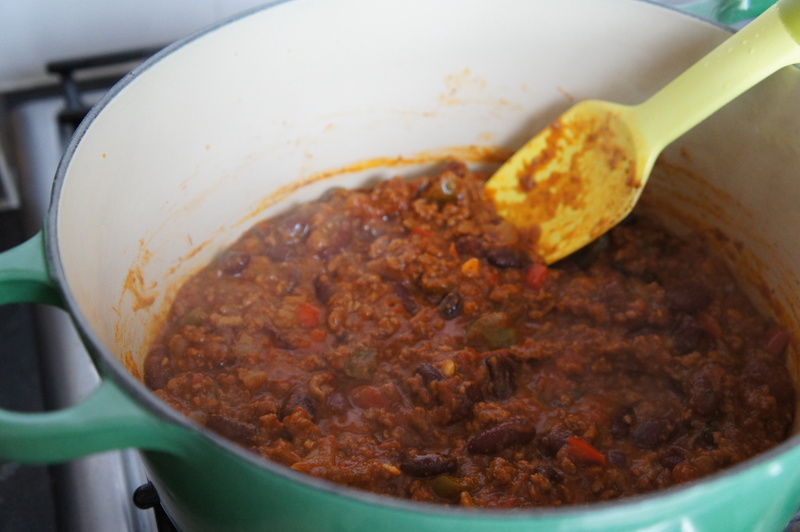 *tip – make this when you have lots of time and it’ll be a joy – if this is the first time you’re making chilli from scratch and you don’t have a lot of time, this will be a nightmare – YOU HAVE BEEN WARNED! 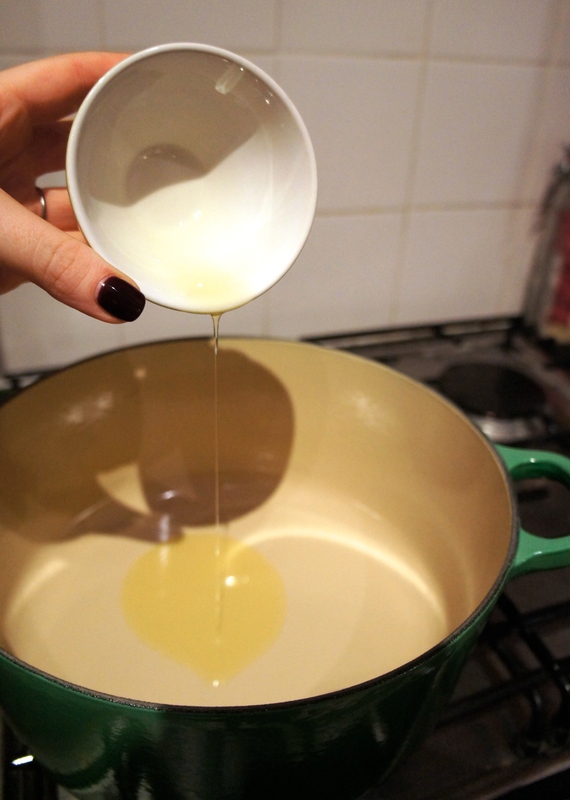 Heat the olive oil in your pot. 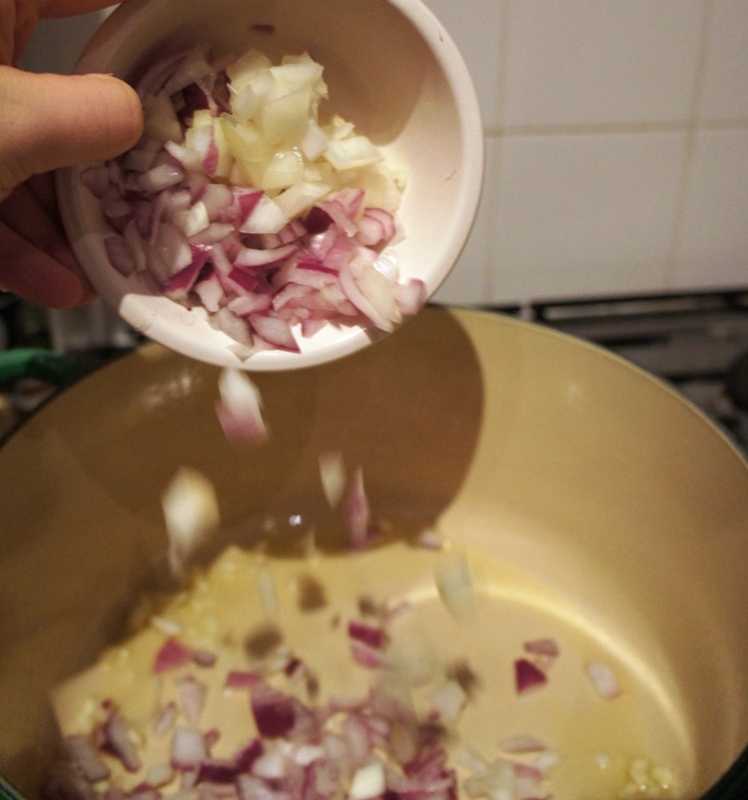 Add the chopped onion and garlic and cook for a couple of minutes until softened. Stir in the ground beef and sear until lightly browned. 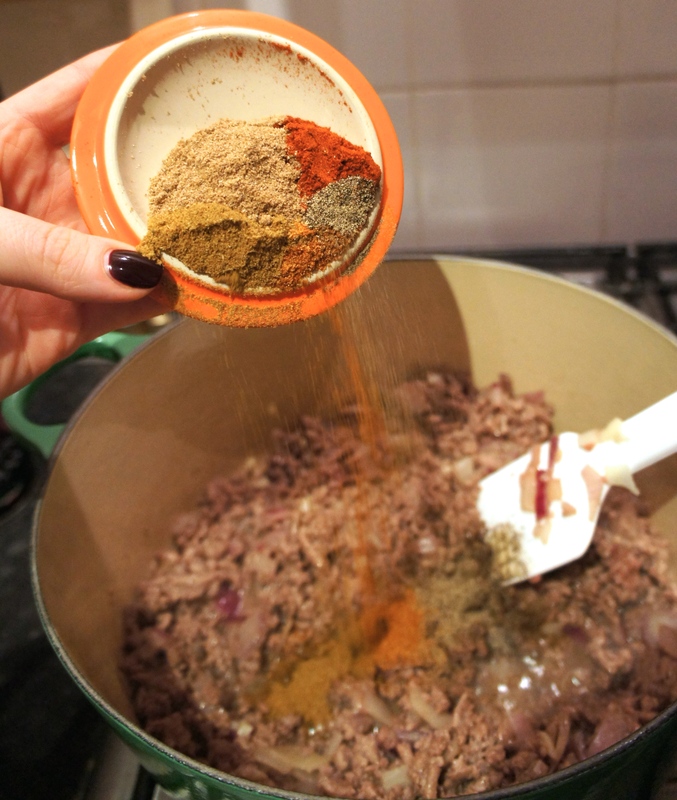 Stir in the chilli powder, paprika, cumin, ground coriander, black pepper and continue to cook for a couple of minutes. 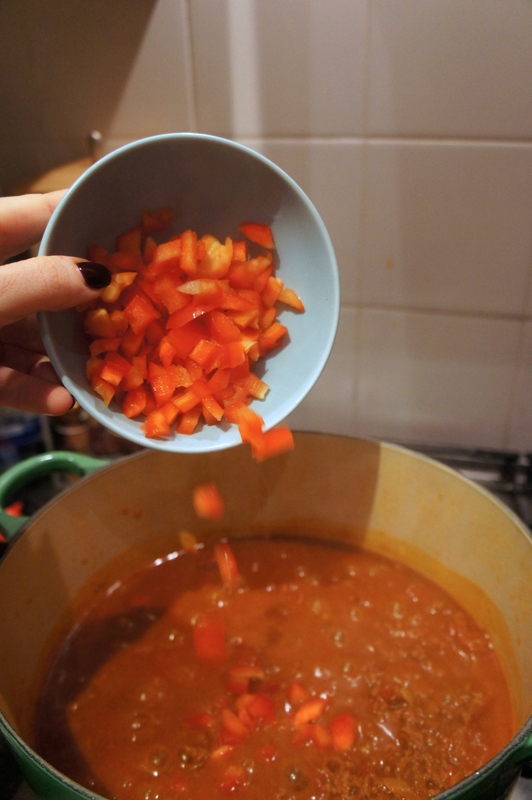 Add the tomato puree, canned tomatoes and beef stock. Bring the contents to a simmer, stir well and place the lid on. Continue to cook over a low heat for 45 minutes. 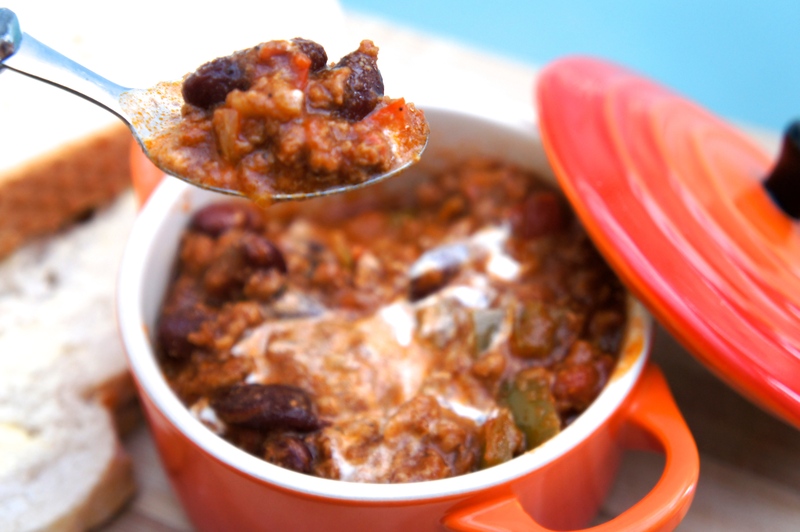 Stir in the chopped vegetables and kidney beans and continue cooking for 20-25 minutes. Stir in enough of the cornflour and water mix to thicken slightly. Add two tablespoons of the chopped coriander. Check and adjust the seasoning to taste. 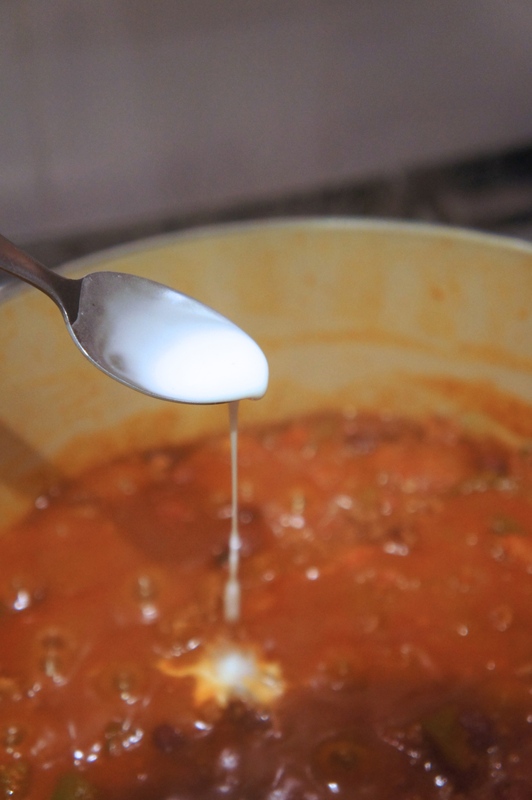 Ladle into bowls to serve and top with a spoon of soured cream. Serve with warm bread, rice or a handful of tortilla chips. I like to serve mine in the Le Creuset petite stoneware casseroles, they look quite small for an adult serving, but as they’re deep they really do pack in a lot! The joy of this recipe is that it can be made the day before and leaving it over night only improves the flavours, so it’s a win, win situation if you’re making it for a big group of hungry tummies! again – nom nom nom 😉 Enjoy! Oh I do love my Le Creuset dutch oven and shallow casserole dish (I have them in the teal and they’re beautiful). 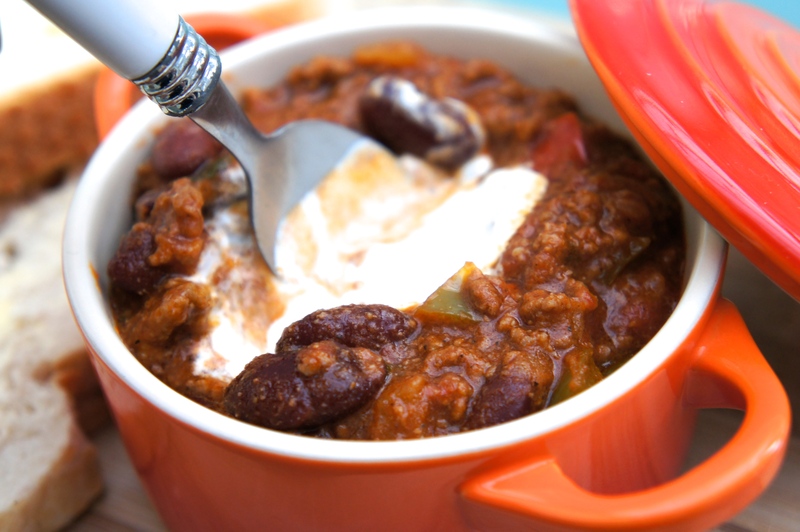 Your Chilli con Creuset looks lovely. I think the best thing about them is how versatile they are, doing bread in them is great as it comes out with a nice crispy crust. Thanks Lisa! I have the utensil jar in teal – such a beautiful colour! Yes, I totally agree – they really are so versatile. Ooh I must have a go at making bread in them, sounds fun! This looks so good! I have always wanted a Le Creuset pot and held back because they’re so expensive, but I may have to splurge and get one! Like you said I think they’re a great investment that will last forever. If you’re anything like me Nicole you won’t regret it – Barty’s next outing has already been earmarked! Tag me on Twitter/Instagram if you upload a photo, would love to see how it turns out for you! Ohhh that looks good, recipe posts always make me hungry! I’m not the best cook, but you make it look so easy. I might have to give this recipe a try, although I don’t have a Creuset pot so I’ll have to use a substitute! 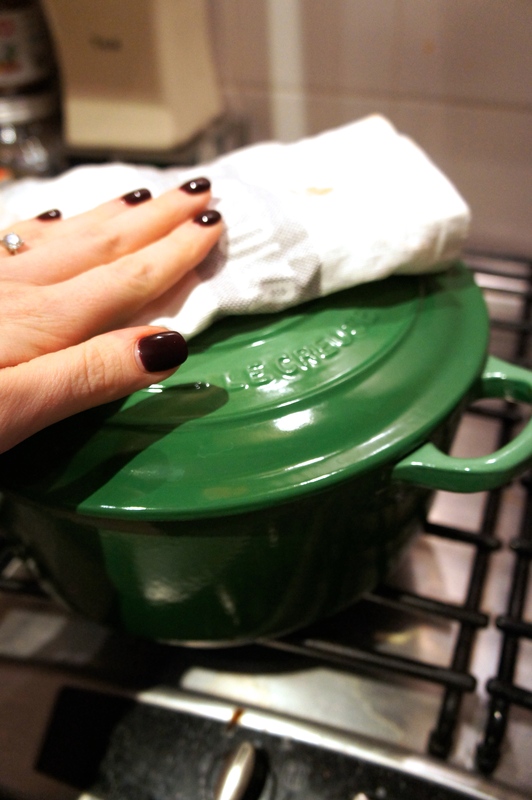 Any good pot will do – I just have a penchant for Le Creuset!! This looks delicious, I really want some Le Creuset pans 🙂 I love your blog and I have followed you with Bloglovin. If you ever get a chance to check out my blog I would be delighted, thanks!